Civilization V as one of the most successful and definitive works of the 4X videogame genre presents a clear narrative of empire-building that, I will argue, is problematic when set against postcolonial theory. With many studies lauding the series for its educational capacities I argue that with an affective turn to the role of the player, the game’s homogenization of narratives of societal progression reinforces a Western-centric notion of history. This co-opts non-colonial societies into imperialism, while in the process silencing their histories. For this study, I will read the game’s goals and mechanics through postcolonial theorists such as Gayatri Chakravorty Spivak and Michel-Rolph Trouillot, and then turn to affect theory to consider what role the player takes in writing this history. To conclude, I will consider what implications this has on the use of 4X games like Civilization V for education and the conception of history in the minds of the players, drawing on other recent scholars who have similarly problematized the series. Figure 1. The introduction to the “Scramble for Africa” scenario when playing as Queen Victoria. January 1881, the Scramble for Africa. Queen Victoria commands the English Empire’s expansion into inland Africa, already controlling a handful of settlements around its coast and on the near coast of Europe: Cape Town, Port Elizabeth, Lagos, Accra, Freetown, Gibraltar, and Victoria. Her mission: explore Africa, expand her territory into it, exploit its riches, and exterminate those who conflict with these aims, be they native Africans or rival Europeans. This is, of course, not the historical so-called “Scramble for Africa” of the late 19th to the early 20th century, but the beginning of a staged scenario in Sid Meier’s Civilization V. Players choose one of 12 leaders with corresponding empires. Jules Grévy leads the French, Otto von Bismarck the Germans, Giuseppe Garibaldi the Italians, and so on. Or, the player may defend Africa from the Europeans as Cetshwayo kaMpande of the Zulu, for instance. In 100 turns (each turn representing a period of months: the first turn is in January, the second in April, the third in July, the fourth in October) the civilization with the highest score is declared the winner (see “Victory Conditions” in Figure 1 for how points are scored in this scenario). I give MOO a XXXX rating because it features the essential four X’s of any good strategic conquest game: EXplore, EXpand, EXploit and EXterminate. In other words, players must rise from humble beginnings, finding their way around the map while building up the largest, most efficient empire possible. Naturally, the other players will be trying to do the same, therefore their extermination becomes a paramount concern” (Emrich, 1993, p. 92). Whether descriptively or prescriptively, this overview encapsulates the core strategies of many games since then. From “humble beginnings”, players manage a fledgling empire as they explore the map around them, expand their territory outwards, exploit the land for its resources and eventually exterminate all rival empires. This is the crux of all 4X games, however each step might be emphasised, re-presented, or complicated. In this essay, Civilization V (with its expansion games Gods and Kings and Brave New World) serves as a case study for exploring its representation of empire building and the writing of imperial histories and narratives. Through its primary means of sale -- digital purchase on the online distribution platform Steam -- the game has become one of the most-played, with over eight million sales, making it a strong presence in modern videogame culture. Postcolonial thinkers such as Gayatri Chakravorty Spivak and Michel-Rolph Trouillot provide a useful lens through which the game’s reworking of colonial history and its treatment of oppressed voices can be further complicated. These considerations will be brought together with affect theory to consider the player’s impact on the process of writing these histories, in particular looking at the implications of using Civilization V in education. To begin, I will briefly outline Spivak’s and Trouillot’s relevant thinking and their position in the field of postcolonial studies. Spivak’s work on the subaltern has been highly influential. Challenging theorists such as Michel Foucault and Gilles Deleuze, she is sceptical of critics who fail to recognise their own ideological frameworks in their writing. This, she argues in “Can the Subaltern Speak?”, leads to generalizing the subject under “totalizing concepts of power and desire” (Spivak, 1988, p. 279). In Conversations with Gayatri Chakravorty Spivak, she concisely tells Suzana Milevska that the “central concept” in “Can the Subaltern Speak?” “was that once a woman performs an act of resistance without an infrastructure that would make us recognise resistance, her resistance is in vain” (Spivak; quoted in Chakravorty, Milevska & Barlow, 2006, p. 62 . This infrastructure refers to hegemonic structures of empire and patriarchy, and in this essay I will make links between these structures and the game’s encoded structures. Spivak has been criticized by writers such as Ania Loomba, Benita Parry and Lata Mani, but her core concept of voices unheard by structures unable to hear them remains useful for this essay. Michel-Rolph Trouillot focuses on the writing of history in Silencing the Past: Power and the Production of History. Using specific examples like the Haitian Revolution of the late 18th century to the early 19th nineteenth century and Christopher Columbus’s landing on the Bahamas in 1492, he observes the processes of historicisation, how they work, what they emphasize and what is silenced. With regards to the Haitian Revolution, he remarks on what he calls formulas of “erasure” and “banalization” which serve to, respectively, “erase directly the face of a revolution” and “empty a number of singular events of their revolutionary content so that the entire string of facts… becomes trivialised” (Trouillot, 1995, p. 96). In the example of Columbus’s landing, he observes a fading of context as the act of exploration is celebrated as a great European achievement. As context is faded out, the event begins to be championed and lauded despite being, as he terms it in a way he feels is more accurate, “the ‘Castilian invasion of the Bahamas’” (Trouillot, 1995, p. 114). Trouillot’s thinking will be useful for conceptualizing the ultimate function of particular game mechanics and structures. 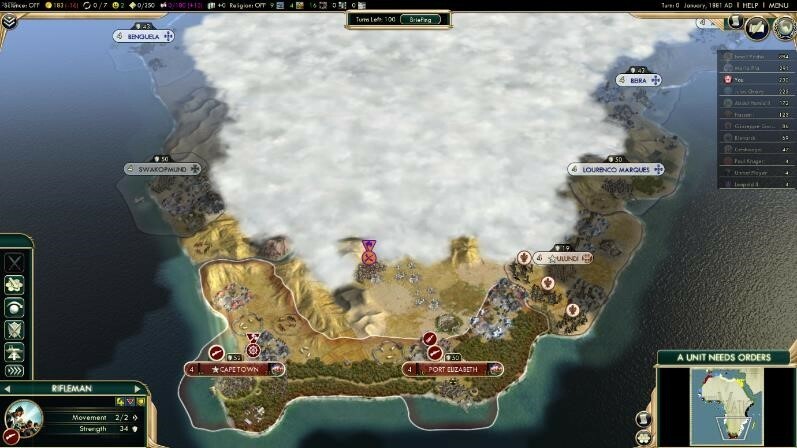 Civilization V is a game of great strategic depth, and so I will not be able to cover all its elements in this essay. However, as I am primarily concerned here with the writing of history and the voices that are heard and silenced in that process of writing, I will start with the game’s timeline, the temporal progression from turn one to victory (or defeat). What are players aiming to achieve? How do the game’s structures guide them? The technology tree provides a clear timeline to trace. Beginning with agriculture, the player is provided with four choices to start researching: pottery, animal husbandry, archery and mining. Each choice leads to a further branch in the tree, culminating in the internet, globalization, particle physics, nanotechnology and stealth. Once everything else is researched, only “Future Tech” is available, which provides nothing but additional score. Crucially, the technology tree presents a homogenous timeline of technological progression. All civilizations -- from Shaka kaSenzangakhona’s Zulu to Augustus Caesar’s Romans to Sejong the Great’s Koreans -- climb the same tree. While there is choice, that choice is limited to a handful of discrete choices made for strategic purposes -- to emphasise strengths or cover weaknesses -- rather than to forge a truly separate narrative. Indeed, the technology tree is tiered into eras that solidify this Eurocentric homonarrativization: ancient, classical, medieval, renaissance, industrial, modern, atomic and information. Tuur Ghys observes the use of the term “technological determinism” to describe technology trees in strategy games and applies the concept to Civilization IV -- the previous game in the Civilization series which uses a similarly-structured technology tree. He uses Michael L. Smith’s definition of the term as “the belief that social progress is driven by technological innovation, which in turn follows an ‘inevitable’ course” (Smith; quoted in Ghys, 2012), and remarks that there is an “inclusion of social and political principles in the tech tree” with “links in which ‘mechanical’ technologies lead to ‘social’ ones” (Ghys, 2012). Some are quite subtle, he says, such as either plastics or fission being prerequisites to researching environmentalism in Civilization IV. Ghys asked lead designer Soren Johnson about this particular link, who called it a “cause-effect relation… plastics led to a boom in disposable items, which eventually made people more sensitive to how wasteful we are as a civilization” (Johnson; interviewed by Ghys, quoted in Ghys, 2012). These kinds of particular socio-political causal chains in Civilization IV’s technology tree make the game’s narrative even more specific and restrictive in its homogeny. Not only does Wu Zetian’s Chinese empire have to research the same listed technologies in roughly the same order as George Washington’s empire, but her society is also implicitly subjected to exactly the same socio-political reactions to events and technologies. A comparable example in Civilization V is the requirement for a civil service and guilds to be researched to lead on to chivalry, which triggers to medieval era complemented with a quote from Le Morte Darthur: “Whoso pulleth out this sword of this stone and anvil, is rightwise king born of all England” (Malory; quoted in Civilization V). The implications of this technological determinism in the technology tree are further exposed when technological links are followed beyond their first step. Ghys observes that researching mysticism in Civilization IV is, by tracing the chain of prerequisites, required for robotics (Ghys, 2012). Similarly, by following Civilization V’s technology chain it is revealed that chivalry is a required technology for particle physics. It seems incongruent when put like that, but what it illuminates is that when technology trees are structured in this linear fashion, they do not provide the player’s civilization with a technological progression unique to their society, and in this process alternative narratives are destroyed. All empires in Civilization V begin at the same pre-determined starting point of human development. The game fails to account both for societies which do not follow the same path of technological progression and for societies that emerge at different times relative to other societies. Indeed, a Scientific Victory is won through what is essentially a version of the 20th-century Space Race. Certain technologies towards the end of the tree enable the production of parts of the space shuttle, once the Apollo Program “wonder” is completed. When all parts are assembled and gathered in the player’s capital city, the ship is launched and the game ends under the premise that the spaceship will be used to colonize nearby star Alpha Centauri. The goal of technological advancement in Civilization V, in other words, is to reach the real-world United States’ crowning Cold War achievement -- no matter which civilization the player chooses. The first of the four Xs -- exploration -- perhaps seems the most innocuous. In the following, I will direct most attention to this specific aspect of 4X games. Apparently driven by mere curiosity, the word exploration suggests no active harm as expansion, exploitation and extermination do. It suggests observation and detached study. However, in this section I will focus closely on exploration firstly because it serves as the foundation, catalyst and prerequisite for the other three Xs, and secondly because the concept and narratives of exploration hold particular colonial connotations that are not as immediately clear. Michel-Rolph Trouillot recounts the historicizing of Christopher Columbus’s landing in the Bahamas in 1492. “How interesting,” he remarks, “that 1492 has become Columbus’s year, and October 12 the day of ‘The Discovery’” (Trouillot, 1995, pp. 112--113). Columbus’s famous landing “has become a clear-cut event much more fixed in time than the prolonged fall of Muslim Granada, the seemingly interminable expulsion of European Jews, or the tortuous consolidation of royal power in the early Renaissance” (Trouillot, 1995, p. 113). Unlike the latter examples, “[t]he Discovery has lost its processual character… become a single and simple moment. The creation of that historical moment facilitates the narrativization of history” (Trouillot, 1995, p. 113). Trouillot asks whether “anyone would care to celebrate the ‘Castilian invasion of the Bahamas’” (Trouillot, 1995, p. 114) and it is in this that the simple narrativization of this single moment in history exposes the colonial frames of exploration. This narrativization fades the context of Columbus’s landing -- “the making of Europe, the rise of the absolutist state, the reconquista, and Christian religious intransigence all spread over centuries” to mention just the Old World (Trouillot, 1995, p. 113) -- into the background, “subsumed among the ‘antecedents’ to The Discovery” (Trouillot, 1995, p. 113). The exploration, itself the “desperate adventure” of one of the “rejects of Europe” (Trouillot, 1995, p. 113), becomes romanticized and celebrated as a great achievement of Europe. Figure 2. 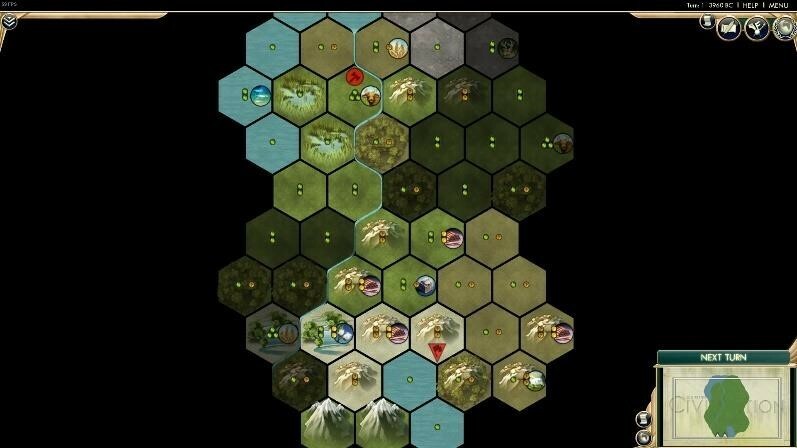 Screenshot of the “fog of war” at the beginning of the “Scramble for Africa” scenario. Exploration is codified into the game in a way that rewards such narrativization. Firstly, returning to the goals of the game, exploration enables the next three Xs. The map begins covered by the “fog of war”, as it is known in strategy games (Figure 2). The player must send explorers into this fog to unveil the land to expand into, the resources to exploit, and the opponents to exterminate. Exploration is not done for curiosity’s sake. In Nintendo and New World Travel Writing, Mary Fuller and Henry Jenkins remark on the de-narrativization of the gamespace in Nintendo games: “Its landscapes dwarf characters who serve, in turn, primarily as vehicles for players to move through these remarkable places… we don’t really care whether we rescue Princess Toadstool or not” (Fuller & Jenkins, 1995, p. 60). In Civilization V (and perhaps strategy games more generally) the opposite is true: Players do not care so much about the natural beauty of the world of the pleasures of traversing it, rather they explore as a means to an end. That end being, of course, the acquisition of strategic resources and information with which to expand their empire. The landscape itself is homogenized, divided up and categorized by type of terrain. Tiles are not part of an organic, unique landscape, rather each tile is merely a visual representation of a type of terrain, and it is the type that is important to players. Hill tiles provide more vision and range when occupied, rough terrains such as forest or marsh slow movement, grassland has a higher base food value. Land is favoured only because of its strategic value. Players do not place new cities next to a mountain because it looks awe-inspiring and the views will be wonderful (indeed, each mountain in the game looks the same). Players settle there because cities next to a mountain are able to build an observatory, which increases that city’s science output by +50 percent. Or when playing as the Incas, because they can build the unique structure of the terrace farm which, erected on hill tiles, provides additional food for each adjacent mountain. Some tiles contain natural wonders like Uluru, Great Barrier Reef and Krakatoa, but again, their only use in the game is statistical. Discovering a natural wonder (unveiling it in the fog of war) grants happiness to the player’s civilization. Exploration is rewarded. Once inside the player’s territory, each natural wonder grants a unique bonus yield. For example, Uluru generates +2 food and +6 faith. Expansion and exploitation are rewarded off the back of exploration. Figure 3. Screenshot of the “Strategic View” with “Hex-Grid” and “Yield-Icons” view options switched on. Paul Virilio’s notion of violent speed can also be used to read these gameplay mechanics. In Speed and Politics, Virilio talks of political power as a compression of time and space, the ability to enact violence faster and from further away. “Around 1870 Colonel Delair notes… ‘the art of defense must constantly be in transformation; it is not exempt from the general law of this world: stasis is death’” (Virilio, 1986, pp. 12--13). This is truly a maxim at the heart of Civilization V. The fog of war masks strategic resources and must be traversed through to uncover those resources. The only codified bonus to staying put is increased happiness. But, even then, the only use for maintaining positive happiness is to build points towards a Golden Age, which provides an empire with bonus production and culture points as well as increased gold income. In other words, its only use is to facilitate other forms of victory, all of which require exploration. The only civilization that remains in relative stasis is Venice, which cannot build more than one city. However, one of Venice’s unique abilities is the option to purchase city states using gold, enveloping them into the Venetian empire: expansion. And, even so, Venice tends to rank extremely low in competitive rankings compiled by players such as FilthyRobot (2015) and shared within communities. To return this argument to Trouillot, exploration is an act celebrated by the game, championed as the means by which success as an empire is achieved. Celebrations of exploration, Trouillot argues, mythologizes history. “They impose a silence upon the events they ignore, and they fill that silence with narratives of power about the event they celebrate” (Trouillot, 1995, p. 118). This mythologizing process in-game strips the world of all history prior to exploration. Natural wonders serve no purpose except in the resources they provide, for example. Indeed, the game’s swarms of “barbarians” are part of this process. The game spawns barbarian encampments across the map, which do nothing but produce unwaveringly hostile military units with technology equal to the game’s most advanced player’s technology (so once the most advanced player can produce musket-wielding troops, so can the barbarians). These barbarians are generic: they have no history and no aim besides destruction for destruction’s sake, attacking the players relentlessly no matter the odds. While the game might be said to be nothing more than its code -- and these barbarians are literally nothing more than that, they have no history, objectively speaking -- they are emblematic of Trouillot’s point: context reduced to obscurity under the celebration of exploration. Civilization V’s barbarians have no history or identity precisely because the game celebrates exploration under the same framework as we celebrate Columbus’s landing in 1492. Except here the game does not need to render those details obscure in this mythicizing of history. It can place those “contextual details” in a position that begins with obscurity. Much of Civilization V has a homogenizing effect, and this in parallel relates to a further point Fuller and Jenkins make on characterization: “In Nintendo’s narratives,” they claim, “characters play a minimal role, displaying traits that are largely capacities for action… The game’s dependence on characters… borrowed from other media allows them to simply evoke those characters rather than fully develop them” (Fuller & Jenkins, 1995). Although here they have fictional characters in mind, a similar technique is employed in Civilization V. Leaders are borrowed from history, but are ultimately only strategic vessels for the game’s action. The course of the game clearly has little to do with accurate historical narratives and so becomes distilled down to strategic decisions. The only differences between civilizations that impact games (rather than the cosmetic differences) are in their unique units, buildings and abilities. The choice of which leader to play as is therefore a strategic decision. Does the player prefer England’s unique ability, or India’s? In creating an arena with more competitive integrity, each civilization finds their entire history filtered into two unique buildings/units and one unique ability. Their history does not provide them with a unique starting point, nor does it alter their ambitions as a society. That is up to the player, who makes a strategic decision in choosing their civilization, not a narrative one. It has been argued that this element is, in fact, a redeeming feature. Ted Friedman, writing on Civilization II in 1999, is not unaware that the game’s “dynamic of depersonalization elides the violence of exploration, colonization, and development even more completely than the stories of individual conquest described by Fuller and Jenkins” (Friedman, 1999, p. 145). However, he argues, “what makes this palatable… is the abstractness of Civilization II. Any nation can be the colonizer… Barbarian hordes are never specific ethnicities; they’re just generic natives” (Friedman, 1999, p. 145). This degree of abstraction is echoed by other critics. Rolfe Daus Peterson, Andrew Justin Miller, and Sean Joseph Fedorko, for instance, agree that the game’s actual historicity is “entirely inaccurate,” but contend that its historical accuracy lies in its conceptual simulation of diplomacy, geopolitics, resource management, and so on (Peterson, Miller & Fedorko, 2013, p. 43). In a way, abstraction is precisely my point. Though far from Friedman’s celebration of the equal opportunity of all nations to conquer, and of the non-ethnicity of barbarians, and of Peterson, Miller and Fedorko’s praise of the conceptual accuracy of the simulation, this abstraction becomes a totalizing and damaging force. (Peterson, Miller & Fedorko 2013 do pick up on this in their conclusion, a point I will return to later.) What I mean by this is that the ethnicity of the barbarians does not matter because they do not matter; the game’s interface presents them as a mindless hindrance to the business of empire-building, rather than as a native people with their own history, culture and values being removed. While all nations do have the opportunity to become the imperial force themselves, they also cannot do anything but be that. In the slow march to the state of eponymous “civilization”, the game presents a Eurocentric imperialist narrative of socio-political and technological development that morphs into a Western Cold War narrative as the only way to do that. With this imperialist narrative coded into the game’s mechanics, what role does the player then take on? Can the player of Civilization V be considered a detached observer, or does s/he write this colonial history herself/himself by immersing herself/himself in the gamespace? Diane Carr criticizes the kind of analysis this essay has so far been engaged in, arguing that “they (the players) share a tendency to focus on the game’s rules and pseudo-historical guise, at the expense of its more playful, less quantifiable aspects” (Carr, 2007, p. 222). Indeed, while my analyses thus far have largely agreed with what Kacper Poblocki in 2002 argues about the Civilization series (I, II and III at that point) -- succinctly put as “every Civilization… has an equal opportunity to become the United States of America” (Poblocki, 2002, p. 168) -- Carr is right to insist on a fresh angle. Drawing on Katie Salen and Eric Zimmerman’s influential Rules of Play, she reminds us that “policy makers, sociologists and civil servants looking to scientific simulations for evidence and players enjoying games… will differ in what they are looking for, and how they are likely to interpret and apply what they find” (Carr, 2007, p. 225). The game’s Western bias and forced imperialist narrative is clear and codified, but in examining the role of the player in writing postcolonial histories it is important to question how players interpret the game’s rules. From that, perhaps it will be possible to forge the links between modes of play inside the “magic circle” of the game and the larger ideological issues of postcolonialism. I am, of course, not saying that players of Civilization are staunch Western imperialists who fetishize the British empire. That would be a very damning conclusion from an author with over 200 hours of playtime on Civilization V clocked. Rather, what needs to be considered is the extent to which the process of rehearsing this narrative through gameplay is problematic. There is a certain rhythm to 4X games like Civilization V. It is intrinsic to the name -- the player chooses her or his civilization and then explores, expands, exploits and exterminates. S/he then finishes the game and repeats the process, playing this narrative again and again. In Civilization V, this process is set in no fantasy world: In playing, the player rehearses the development of Western civilization. Anna Gibbs’s chapter “After Affect: Sympathy, Synchrony and Mimetic Communication” provides a useful framework through which the player’s interaction with the gameworld can be understood. Although she is not writing on videogames specifically, she remarks that “reading fiction produces new affect states in us, which change not only our body chemistry, but also… our attitudes and ideas as we shaped from a narrative a structure of meaning” (Gibbs, 2010, p. 193). This, she says, is the result of mimicry: “a response to the other, a borrowing of form” (Gibbs, 2010, p. 193). Civilization V might not be breeding a generation of ruthless imperialists, but it may well be reinforcing notions of history that focus on the West and champions war in a way that celebrates singular events to the detriment of their contexts, to refer back to Trouillot. Josef Köstlbauer uses the word mimicry, in this case borrowing from Johan Huizinga, to apply directly to simulation games such as Civilization, remarking that “simulation games inhabit the spaces in between play and reality” (Köstlbauer, 2013, p. 172). Carr takes a ludic approach that suggests a degree of separation between the game inside the “magic circle” and the world outside. She draws on David Myers who, after analysing online discussions between dedicated players, concludes that the “most frequently discussed aspects of the game… are the relationships among in-game signifieds -- without reference to or really any concern about their significance (or signification) outside the game context” (Myers; quoted in Carr, 2007, p. 227). However, many have been calling for just that connection between in-game signifieds and the real world histories to which they refer. John K. Lee observes in his study that “students did develop factual knowledge” by playing Civilization III (Lee, 2010, p. 23), and concludes that “teachers might want to consider using games such as Civilization III in whole class learning activities” (Lee, 2010, p. 24). On the website LearningWorks for Kids, Civilization V is given a “Learning Quotient” of 9.6 out of 10, reflecting “how well the media balances entertainment quality with the potential for improving thinking skills and academic proficiency” (LearningWorks for Kids, n.d.). Edward Webb reflects on his use of Civilization IV to teach undergraduate students, stating that he has had “increasing success” in helping “upper-level undergraduates grasp the nuances of complex political, social, and economic processes” (Webb, 2013, p. 3). These suggestions are all made under the implicit assumption that the history provided in the Civilization series is accurate and therefore suitable for learning. There are, of course, more nuanced discussions that do problematize the content of the series. While Jeremiah McCall makes a compelling case for the use of historical simulation games such as Civilization in secondary education, he acknowledges that the series “is not particularly well suited to retracing the exact path of a specific historical civilization” (McCall, 2011, p. 45). He instead focuses on the broader, conceptual elements that such games can reinforce, such as the importance and balance of geopolitical relationships, resource management, and so on. While precise historicity is not part of the Civilization series’ remit, “as a general model of how civilizations develop and interact, however, Civilization offers some highly defensible models,” citing the link between productivity and happiness as an example (McCall, 2011, p. 24). Similarly, as discussed earlier in this paper, Peterson, Miller and Fedorko remark also on the usefulness of the simulating aspects of the Civilization series, but temper that with an acknowledgement that the series “reveals a bias toward representing all of history as inevitable and constant scientific advancement and social progressivism” but that aspect “affords room for critical thinking and critique” (Peterson, Miller & Fedorko, 2013, p. 44). Adam Chapman in his paper “Is Sid Meier’s Civilization history?” stresses that if the games are to be considered histories, then they must be treated as such: subjective, biased narratives guided by Althusserian ideological pulls (whether consciously or unconsciously) (Chapman, 2013, pp. 312--332). In this vein, responsible employment of Civilization games in educational contexts should include some degree of engagement with the games’ embedded imperial ideology. However, not all proponents have included this caveat. Carr (2007), quoting Myers, is right to bring up the distinction between in-game signifieds and external sign systems, but the discussions she quotes are conducted between dedicated, high-level players on online forums who clearly have an interest in optimizing their play for victory: an inherently more ludic approach. Advocacy for Civilization games to be used as learning tools suggests in itself that this disconnect is not universal or intrinsic to the game. Indeed, the game makes an explicit connection by using the names and likenesses of historical leaders and setting up game scenarios based on historical events. So, the question then becomes whether or not using 4X games as educational tools is intrinsically problematic. Lee provides examples of his students’ educational progress, noting that “students we [sic] able to define embassy and were able to articulate at least one problem that beset Jamestown settlers” (Lee, 2010, p. 23). This might seem a laudable (if small) achievement for the use of Civilization III in education; but here, Gibbs’s notion of mimicry is helpful. Students learn what an embassy is in basic terms, but in playing the game they also rehearse the historical narrative coded into the structures of gameplay that frames the implementation of embassies in the game. As a specific example, embassies in the game are implemented through the diplomacy menu. If the target leader accepts the player’s request to set up an embassy, their capital is revealed to that player through the fog of war. Therefore, a strategic move can be to establish an embassy under the guise of diplomacy simply to get the precise location of their capital city marked on the game’s map so that the player can attack. This gameplay mechanic is not based off of real world military or diplomatic strategy, and yet comes packaged with the concept of diplomacy-through-embassy in-game. The same can be said of elements discussed previously in this essay. A student might learn the etymology of the term “barbarian”, but may receive with it the dehumanizing colonial ideology that surrounds in-game barbarians. Postcolonial theory on the writing of history and the treatment of colonized voices allows us to consider further why games in the Civilization series are problematic, particularly when used in education. In “Can the Subaltern Speak?”, Gayatri Chakravorty Spivak contends that there is a need to avoid “reintroduc[ing] the subject through totalizing concepts of power and desire” (Spivak, 1988, p. 279) in colonial discourse and analysis. She is concerned that critics who fail to acknowledge their own ideological framework in which they live, observe and write, merely end up generalizing and co-opting subaltern peoples into the Western narrative. With a framework such as Civilization V, the subaltern in Spivak’s terms is inextricably suppressed within the game’s rules. There is no path to victory that does not employ the internal and external logics of empire structures, nor are there any avenues for subaltern insurgency. Spivak discusses a “violent aporia” (Spivak, 1988, p. 206) within which the female subaltern lies. Constricted by native patriarchies and foreign imperial hegemonies, there is no structure within which their voice can be heard, no mode of interpretation for their acts. Similarly, Trouillot notes the trend in history to silence events and zeitgeists by modifying the structure in which they are read. Using the example of the Haitian Revolution of the late 18th century to the early 19th century, he claims that “the chain of events that constitute the Haitian Revolution was unthinkable before these events happened” and then as they did happen they were instead “systematically recast by many participants and observers to fit a world of possibilities” (Trouillot, 1995, pp. 95--96). In other words, overarching grand narratives deny the inclusion of contradictory voices, and in doing so silence those voices. Defined by a coded set of rules, Civilization V presents a framework that is even less impenetrable. Not only do the tragic acts of female subalterns (to use Spivak’s examples of sati) go unregistered, they simply do not even exist in the gameworld. Indeed, women themselves are a scarcity, appearing almost nowhere except as leaders (who belong to a significantly less oppressed class of people anyway). These insurgent acts, the cries of the subaltern as it may be put, do not need to be ignored or co-opted because the game’s framework does not even permit their existence in the first place. Under these terms, then, Civilization V becomes a pure manifestation of the imperial grand narrative that allows for no competing narratives, blind to even the nuances within that narrative -- such as class issues. When employed in historical education, it is this conceptualization of history that is being engaged with. As reinforced by Foucault and Soja this notion of space as empty, static and disembodied has become central to a Western ontology of spatial creation and representation. We can see how this has become the standard for the majority of computer games in which the objects and avatars are made up of 3D geometry placed in an empty and bounded space (Flynn, 2008, p. 120). This is also the case with Civilization V -- indeed it is immediately apparent in the hex tile formation of the gamespace. “Navigation of the computer space is a cultural act where social practice, gender, and ideologies of representation are inoperable for the gameplay event”, Flynn claims (2008, p. 141). Building on the work of space and place by theorists such as Lefebvre, it becomes increasingly clear that the lived, navigated space is inseparable from that space’s ideological constructs. And why should that not also be the case in games? Writers including Flynn, but also Brett Nichols and Simon Ryan have equated gameplay to Edward Soja’s “third space” and Lefebvre’s “lived space” which -- while being distinct from the empirical and representational spaces that precede it -- are also inextricably involved in it: “Space operates as a metaphoric, expressive, and sensual language operating in a dialogue with the embodied subjectivity of the player”, concludes Flynn (2008, p. 144). This spatial approach would suggest that even for the more ludic player who has detached in-game signifiers from real-world sign systems moving through the gamespace is inescapably ideological. Figure 4. 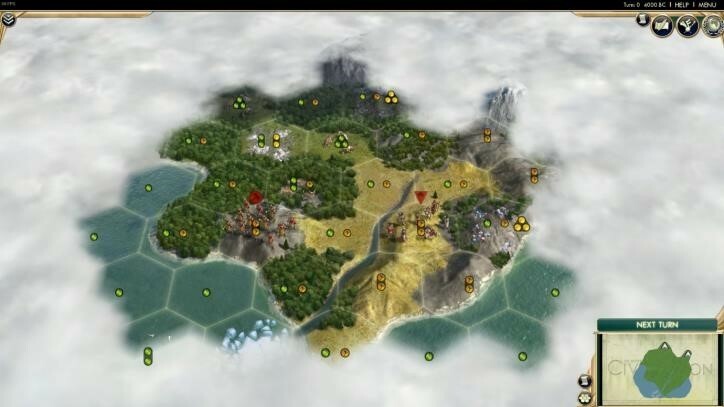 Screenshot of a typical space in Civilization V with “Hex-Grid” and “Yield-Icons” view options switched on. If moving through the gamespace is a social, ideological, representational act in terms of that player’s relationship with space, then we must return to how players move through that space. This brings us back to the game’s rules and structure, by which movement are heavily guided and incentivised with spatial expansion. In high-level strategy, two types of macro game plan are referred to as “tall empires” and “wide empires”. “Tall empires” harbour few cities (usually three to four) and funnel their resources into them, typically aiming for a cultural, diplomatic or scientific victory. “Wide empires”, by contrast, expand aggressively and rapidly, intending to hold large amounts of wide-distributed territory for stronger military positioning and monopolization of resources. But both methods are intrinsically engaged with space and expansion. Unlike in real wars, borders do not need to be recognised by other civilizations -- they simply exist. This is a Western conception of space too: Geopolitical territories are coded into the game. Stepping into another’s territory without an open-borders agreement automatically declares war. The game enforces Western conceptions of space even more strongly than in real life, both in more abstract terms -- geometrically as Flynn mentions -- and geopolitically, forcing a discourse of land ownership that is inescapably imperial. To return to Spivak, this quashes even further the possibility of insurgency, which is obliterated spatially from the game map. The only agents that are able to traverse space are those belonging to empire -- all others are reduced to statistics and sub-humans: (un)happiness, barbarians, production levels. The question posed asks whether or not Civilization V is a problematic game in terms of postcolonial thinking, how and why that might be, and what implications that might have. Ignoring the role of the player for one moment, the game’s structures and rules clearly develop an imperialist narrative. This is not something the game’s developers have tried to hide. Even aside from the 4X genre, the first line of the game’s description on Steam challenges players to “become Ruler of the World by establishing and leading a civilization from the dawn of man into the space age: Wage war, conduct diplomacy, discover new technologies, go head-to-head with some of history’s greatest leaders and build the most powerful empire the world has ever known” (2K Games, 2010). For why this kind of game might be problematic, the player must be included into the equation, along with the game’s standing in videogame culture and wider society. The game’s position in the videogame world is well-established. Over eight million sales on Steam solidify it as one of the current most-played games, and as established earlier in this essay, the title has gained some traction more widely for its perceived educational capacity Carr (2007) argues for a level of detachment between in-game signifiers and the real world ideologies they refer to. When players talk about expanding into enemy territory, killing the natives as if they were annoying flies, and using religion purely as a tool to further their empire, that discourse is not seeping into real world discourses on empire. For Carr (2007), the barrier between in-game signifiers and real world sign systems is impermeable -- one is not influenced by the other in any significant way. There is certainly true in this line of argument: Civilization V is not breeding a generation of ruthless imperialists. However, this detachment is not universally steadfast. Those who call for the series’ use in education expose a permeability in the passage of in-game signifiers to real world applications. They hope for students to play the game, make connections between events, objects and concepts within the game and reapply those to their real world counterparts. The game exposes a different problem which pertains to how players engage with a version of history that is presented from a limited and limiting Western perspective and the structure that, as Spivak and Trouillot -- and, for example, the subaltern historians -- illuminate, silence voices and histories that run counter to the Western narrative of progress and modernity linked to imperialist notions of civilization and conquest. Taken on its own, therefore, it seems logical to conclude that Civilization V is unsuitable for a balanced, globalized education of history and colonialism. 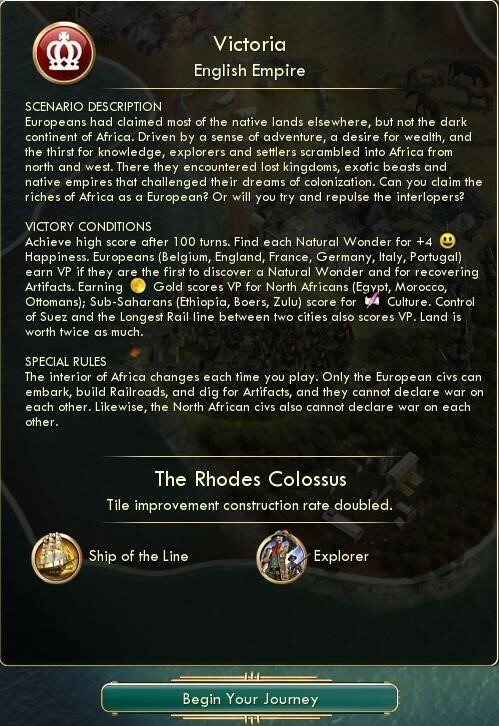 However, there could well be success found in balancing the use of the Civilization series with discussions of these problems, using the game as a way of engaging students and introducing the basic elements before discussing postcolonial thought through a critiquing and problematizing of the game’s underlying structures and of historiography itself. Such an approach would align with Adam Chapman, who proposes that “approaching the historical videogame from the historian’s perspective allows us to allay many concerns and criticisms by showing that these are epistemic issues that are inherent to history rather than the videogame” (Chapman, 2013, p. 327). Studies of an empirical nature on this topic of education using Civilization could also go a long way to revealing more comprehensively the affective impact of the games on students’ and players’ view of history and colonialism. Caught between “patriarchy and imperialism, subject-constitution and object-formation, the figure of the woman disappears, not into a pristine nothingness, but into a violent shuttling which is the displaced figuration of the ‘third-world woman’ caught between tradition and modernization… a violent aporia between subject and object status”, as she puts it in “Can the Subaltern Speak?” (Spivak, 1988, p. 206). 2K Games. (2010). Sid Meier’s Civilization V. Steam, Sep 23. Retrieved on December 14, 2015: http://store.steampowered.com/app/8930/. Carr, D. (2007). The Trouble with Civilization. In B. Atkins & T. Krzywinska (Eds. ), Videogame, Player, Text (pp. 222--236). Manchester: Manchester University Press. Chakravorty, S., Milevska, S., & Barlow, T.E. (2006). Conversations with Gayatri Chakravorty Spivak. Oxford: Seagull Books. Chapman, A. (2013). Is Sid Meier’s Civilization History? Rethinking History, 17, pp. 312--332. Emrich, A. (1993). MicroProse’ Strategic Space Opera is Rated XXXX! Computer Gaming World, 110, pp. 92--93. FilthyRobot. (2015). Filthy’s Civilization Tier List 2.0. Google Drive, Jan 30 Retrieved on December 14, 2015: https://drive.google.com/folderview?id=0BybM2PD7AqoKYlZHTTZQS1docVk&usp=sharing. Flynn, B. (2008). The Navigator’s Experience: An Examination of the Spatial in Computer Games. In Swalwell, M. & Wilson, J. (Eds. ), The Pleasures of Computer Gaming: Essays of Cultural History, Theory and Aesthetics (pp. 118--146). Jefferson: McFarland & Company. Friedman, T. (1998). Civilization and Its Discontents: Simulation, Subjectivity, and Space. In G.M. Smith (Ed. ), On a Silver Platter: CD-ROMs and the Promises of a New Technology (pp. 133--150). New York: NYU Press. Ghys, T. (2012). Technology Trees: Freedom and Determinism in Historical Strategy Games. Game Studies [online], 12:1. Retrieved on December 10, 2015: http://gamestudies.org/1201/articles/tuur_ghys. Gibbs, A. (2010). After Affect: Sympathy, Synchrony, and Mimetic Communication. In M. Gregg & G.J. Seigworth (Eds. ), The Affect Theory Reader (pp. 186--205). Durham: Duke University Press. Köstlbauer, J. (2013). The Strange Attraction of Simulation: Realism, Authenticity, Virtuality. In Kapell, M.W. & Elliott, A.B.R. (Eds. ), Playing with the Past: Digital Games and the Simulation of History (pp. 169--183). New York: Bloombury, 2013. LearningWorks for Kids (author unknown). (n.d.). About the Learning Quotient (LQ). The Gadget. LearningWorks for Kids, Retrieved on December 10, 2015: http://learningworksforkids.com/dev-broken-components/about-lq/. �"�"�" (author unknown). (n.d.). Sid Meier’s Civilization V. The Gadget. LearningWorks for Kids, n.d. Retrieved on December 10, 2015: http://learningworksforkids.com/playbooks/sid-meiers-civilization-v/. Lee, J.K. (2010). Civilization III and Whole-Class Play in High School Social Studies. The Journal of Social Studies Research, 34:1, pp. 1--28. Retrieved on December 10, 2015: http://dhpp.org/images/researchpubs/lee%20article%2034.1.pdf. Loomba, A. (1998). Colonialism/Postcolonialism. London: Routledge. Malory, T. (1998). Le Morte Darthur: The Winchester Manuscript. New York: Oxford University Press. Mani, L. (1992). Cultural Theory, Colonial Texts: Reading Eyewitness Accounts of Widow Burning. In L. Grossberg, C. Nelson, & P. Treichler (Eds. ), Cultural Studies (pp. 392--405). London: Routledge. Parry, B. (1987). Problems in Current Theories of Colonial Discourse. Oxford Literary Review, 9, pp. 27--58. Peterson, R.D., Miller, A.J., & Fedorko, S.J. (2013). The Same River Twice: Exploring Historical Representation and the Value of Simulation in the Total War, Civilization, and Patrician Franchises. In M.W. Kapell & A.B.R. Elliott (Eds. ), Playing with the Past: Digital Games and the Simulation of History (pp. 33--48). New York: Bloombury. Poblocki, K. (2002). Becoming-State: The Bio-Cultural Imperialism of Sid Meier’s Civilization. Focaal -- European Journal of Anthropology, 39, pp. 163--177. Salen, K. & Zimmerman, E. (2003). Rules of Play: Game Design Fundamentals. Cambridge: MIT Press. Smith, M.L. (1994). Recourse of Empire: Landscapes of Progress in Technological America. In L. Marx & M.R. Smith (Eds. ), Does Technology Drive History? : The Dilemma of Technological Determinism (pp. 37--52). Cambridge: MIT Press. Spivak, G. (1988). Can the Subaltern Speak? In C. Nelson, C. Grossberg, & L. Grossberg (Eds. ), Marxism and the Interpretation of Culture (pp. 271--313). Basingstoke: Macmillan Education. Trouillot, M. (1995). Silencing the Past: Power and the Reproduction of History. Boston: Beacon Press. Virilio, P. (1986). Speed and Politics: An Essay on Dromology, translated by M. Polizzotti. New York: Semiotext(e). Webb, E. (2013). Learning (Together) with Games -- Civilization and Empire. Gaming in Education Academic Commons, Special Issue: Games in Education, p. 3. Retrieved on December 10, 2015: http://mcpress.media-commons.org/gamesineducation/learning-together-with-games-civilization-and-empire/. Firaxis Games. (2001). Sid Meier’s Civilization III [PC]. Lyon: Infogrames. Firaxis Games. (2005). Sid Meier’s Civilization IV [PC]. Novato, CA: 2K Games. Firaxis Games. (2010). Sid Meier’s Civilization V [PC]. Novato, CA: 2K Games. Simtex. (1993). Master of Orion[MS-DOS]. Hunt Valley, MD: MicroProse.